Friday. 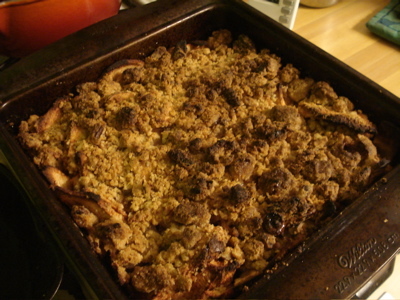 I managed to eat ALL of that apple crisp last night, this morning, and as a late lunch today. Boh and I just took a nice, sunshine-filled walk around the neighborhood, and I’m hoping that I have energy enough to do a bit more work this afternoon. black beans and sour fig. I got home from campus this evening and just could not find the energy to tackle anything in the work pile. So I started simmering some black beans in the crock pot and sat down at my wheel. 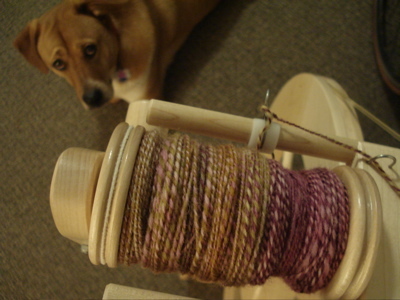 This is the second bobbin of Sour Fig, shetland from the Hello Yarn Fiber Club. I don’t know what I will make out of this yet, but it will be for me! 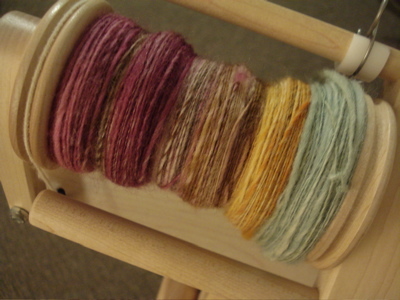 The beans weren’t tender yet, so I decided to start plying. And when I filled my bobbin, I wound the yarn onto my niddy-noddy, counted up my yardage (201! ), gave the loop of yarn a bath, and hung it to dry. It is late. Like, way past my bedtime late. But I’m here, sipping a mug of tea, listening to Nanci Griffith (“I been sifting through the layers, dusty books, and faded papers…), and slowly planning the work I’ll do tomorrow. I might even ply up the rest of this stuff tonight. I’m super excited to see how this ends up. 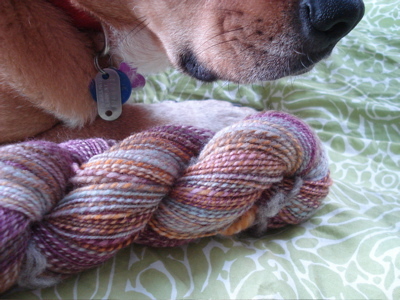 I’m aiming for a 2-ply dk weight, but this stuff wants to be spun fine, so we’ll see what happens. Yep, another picture of this sweater. The fit is a bit awkward, the armholes are huge, the seams are wonky, even the ends are poorly woven in. I love the big ribbed collar, but I think the reason I wear this sweater more than any of the others I’ve made is that it was my first, finished in February 2008. I wear it to late night reading groups, to dinner at friends’ homes. I pull it on to take Boh outside in the morning, I curl up in it on the couch. I buy groceries and write papers in it. 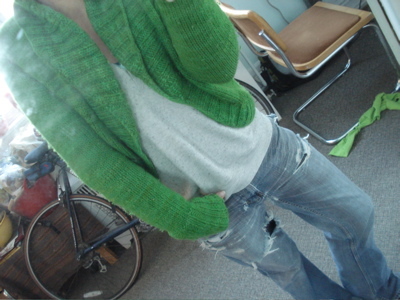 It fits over many layers, even other sweaters, which is often how I wear it. It warms me, in more than the obvious way. I’ve been reading/discussing Rushdie this week, and these rather silly ruminations on my green sweater make me think of something his narrator says in Midnight’s Children. “Reality can have metaphorical content; that does not make it less real” (230, in my 1991 Penguin edition, though this was first published in 1980). Time to slip my arms into the green sweater and get back to work. 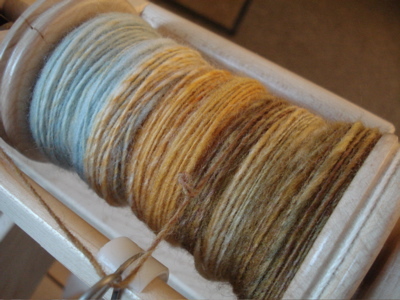 I was digging through my fiber bin yesterday, and found some shetland in progress on a spindle, as well as some singles stored on metal knitting needles, patiently waiting to be plyed or finished. 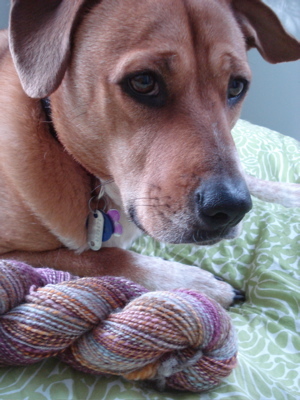 I worked on the shetland for a little while, and just had to snap this picture of Boh, laying on my left foot, back arched and ears-a-flapping, directly underneath my spindle. 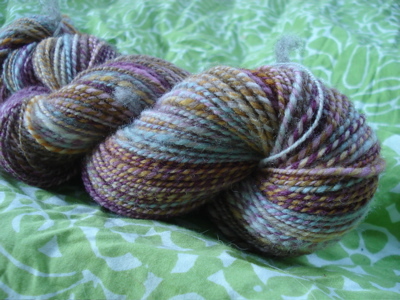 This is shetland from A Verb For Keeping Warm in the Fruit Loops colorway. 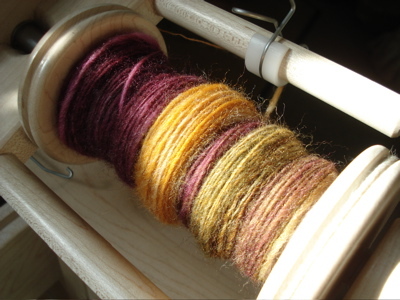 I have a little bit left to spin of the brown and red section, but the spindle was getting heavy, so I wound it onto the niddy noddy and set the twist. I did the same with the stored singles from the other half of this bump, which was much bluer/multi-colored. Bobbin #2 is moving right along. The colors are hard to capture when the light is wierd, but these pictures are pretty accurate — I love that chunk of super-bright turquoise on the right! After the dilly beans, I decided to keep on tackling the zucchini that is taking over my fridge. Last night, I made a big batch of summer squash and zucchini pancakes. It is roughly roosting time, and while I have shared open-air spaces with bat families before (see posts from last summer), I am not that interested in sharing my in-town, rather small apartment with a winged rodent (as my father calls them). I trapped the bat in my bedroom, shut the door, and packed some fabric at the base of the door so that the bat would not be able to squeeze underneath. I got out my headlamp, grabbed a dinner knife, and went outside to pry the screen off one of the bedroom windows to give the bat a clear escape route. And then I waited. 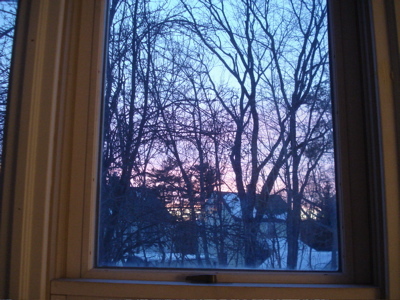 I finally opened up the bedroom and took a look around, and it appeared that the universe had righted itself. So I replaced the screen, and went back to my evening plans. And then Boh started to bark in the direction of the 1960s-style dress I have hanging on my bedroom wall. I went back in the bedroom, only to find my bat peaking out from behind the Jackie O-inspired wide neckline of the dress. I closed the door, repried the screen off the window, and watched through the window as the bat yawned and found a cozy spot to take a nap. This bat was serious about moving in. I called my dad for advice, and in between comparisons to a situation in which he’d had to deal with a hummingbird trapped in the garage (NOT the same thing as a bat in the bedroom), reminders of a summer vacation we’d taken when I was a baby that involved bats and netting over my crib at night, and a lot of laughter on his part (“Well, do you think it is a vampire bat? How big are its fangs?”), he recommended broom warfare and gave me a pep talk. At about 11 o’clock last night, I put on my raincoat, pulled the hood up over my hair (to prevent any sort of accidental touching of the bat or entanglement in my curls), barged into the bedroom, and took a golf-like swing at the wall, sweeping the bat towards the window, and likely disorienting it with the force of the blow. It landed, stunned, in a plate full of shiny jewelry on a shelf near the window. I picked up the plate and set it on the ledge, and gently poked the bat with the broom bristles until it flopped out the window. 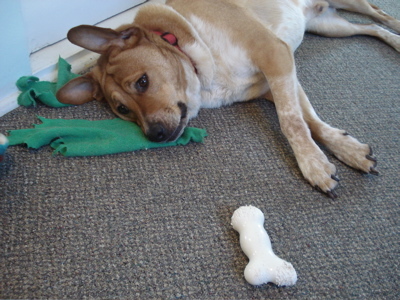 And, that, my dear friends, is the complete story of Rooster vs. Bat, 2009. That (hopefully) concludes our bat content for the year. More knitting, spinning, and cooking to come! First of all, THANK YOU for all of your kind comments re: the stress of the end of the semester and my very exciting should-be-here-on-Tuesday purchase. Yay! I turned in paper #1 on Saturday, and paper #2 Wednesday at noon. Yesterday I spent the afternoon cleaning: kitchen, trash, 4 loads of laundry, vacuuming, etc. and even made a trip to a great farmstand to replenish my dwindling supply of fruits of vegetables. I actually enjoy a lot of the parts of keeping house, but these tasks are extra-enjoyable when you’ve had to neglect balance in favor of meeting a deadline or two. 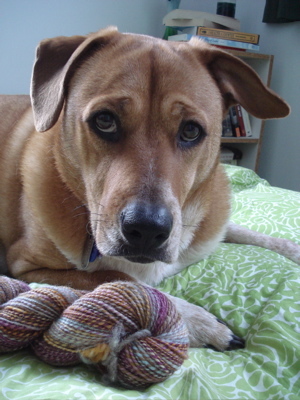 One more project, due at the end of the month, and it will be summer, which to me, means the chance to read more slowly, keep getting to know New Home, and enjoy the company of the dog (and my spinning wheel)! Enough daydreaming, it will be here soon enough! Last night I finished up the sleeves of my whisper cardigan – time to pick up a zillion stitches! Must fortify myself with coffee first. I lengthened the sleeves — they are about 9 inches long — a half inch of 1×1 rib at the elbow, and then 8.5 inches of stockinette. I decided to make the 22 inch size across the back, and I’m happy with that choice. 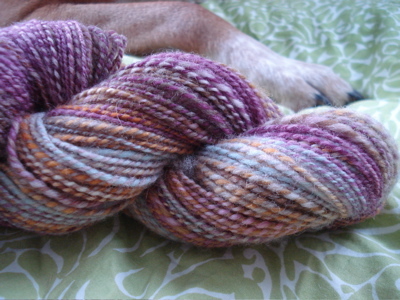 I’m still on my first skein of shadow, which is hard to believe. While knitting with laceweight on 7s is still slower than knitting worsted, it isn’t as slow as I thought it would be. I’m hoping to keep making steady progress on this sweater, as it seems like the perfect amount of warmth to keep tucked in a bag for when the sun sets! 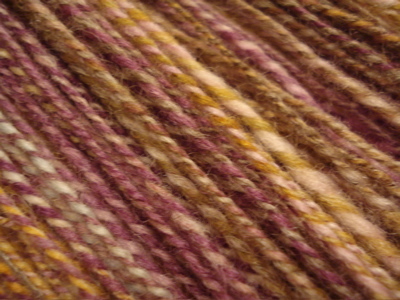 The fiber is shetland from the AVFKW fiber club. The colors are so rich — and coming off on my hands a bit, but I don’t mind. Alright! 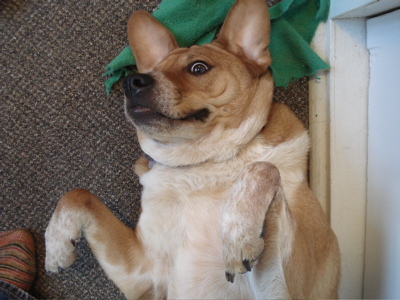 Boh and I have plans to spend some serious time at the d-o-g-p-a-r-k today. He was very patient during all of the paper-writing, and has earned a lot of playtime. Happy Thursday!